Gaffers tape is a strong, cotton cloth pressure sensitive tape, that's an essential, all-purpose tool for theater, film and television productions as well as live performances and any other kind of stage work. There is virtually NO end to a very long list of possible uses for what may very well be the best kind of cloth tape EVER. Used by gaffer's (of course), camera operators and assistants, stage hands, lighting crews, artists, live sound engineers, and the list goes ON! Applies and cuts easily, holds FAST, and removes without leaving sticky residue. What more could you ask for! 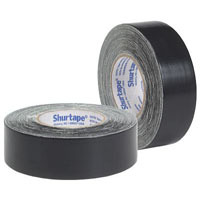 Besides Gaffer's we also carry a number of other Tape Products to help with any situation you may have!